In every installation of Windows XP there is a built-in and default administrator user account named Administrator, which is equivalent to super user or root in Unix system. 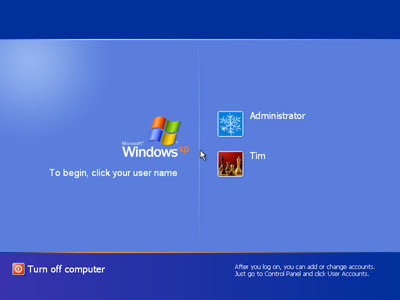 However, if you have set up another user account in Windows XP, the Administrator account will be hidden, cloaked and invisible in User Accounts or Computer Management. Now the Question is How to Unhide it? To see the Administrator account, you have to Boot Windows in Safe Mode. However, you can modify the Windows registry so that the Administrator account will be shown at Windows XP Welcome screen for you to select, in the Control Panel’s User Accounts and in the local user lists in Computer Management. 3. Double-click the Administrator key in the right pane. tree in the pane, choose New, DWORD Value, name it Administrator and press . 5. Type 1 in the Value data box, and press .